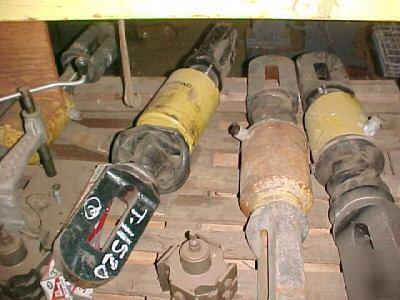 4 used cylinders for pulling large sections, plates, and sub assemblies for welding, positioning, or fitting. Model BRP-1006. Saves need of an expensive yard crane to do the job. Selling used, as-is. Price is for all 4 pieces. (The largest Enerpac makes today of this type cylinder is 60 tons.) Cylinders have 6 inches stroke. Can run on either hand or power unit, 10,000 psi rated cylinder, and holds 129 cubic inches of oil.